I had a somewhat belated craving for hot cross buns yesterday, a carry over from the last few weeks addiction. Do try this one, it is the most tender version I’ve ever made at home. They look a little rustic, as I was a little hasty in shaping them, getting excited about eating them! 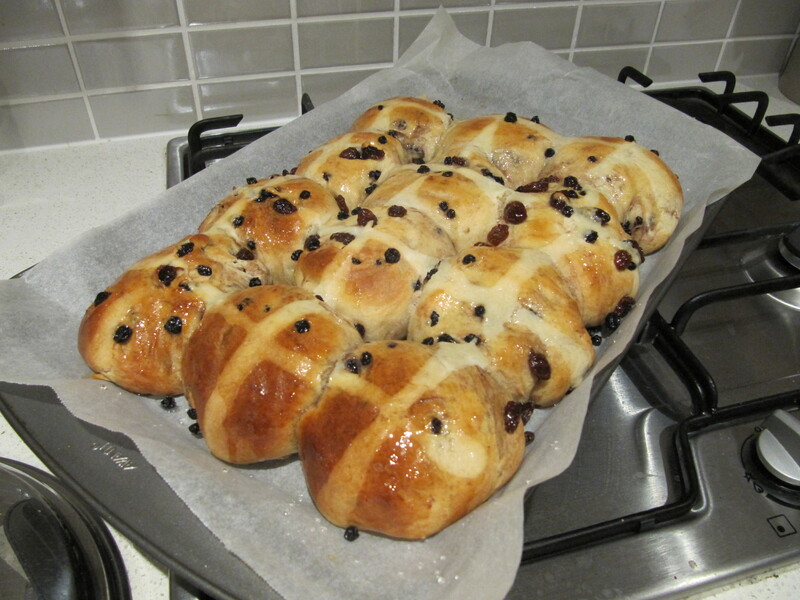 I wanted to say ‘failsafe hot cross buns’, as this recipe is straightforward. The dough only needs to be mixed for 4 minutes and then left to rise for about 2 hours. I’ve been playing around in my Professional Baking book which is what this recipe is based on- that’s also why all the measurements are in grams. 1 Preheat oven to 50-100°C. For the sweet dough, add butter, sugar, salt and milk powder to the bowl of an electric mixer and mix until combined. Add eggs and mix until absorbed. Add water and mix well. 2 Add flours, yeast and allspice and mix on low to medium speed for 3 and a half minutes. Add currants and sultanas and mix on low speed for 30 seconds until mostly incorporated into the dough. 3 Remove bowl from machine, cover with cling wrap and lay a tea towel on top of the bowl. Place the bowl in a warm place such as on the open the oven door with the oven set to 50-100°C for two hours or until dough has risen. Increase oven to 190°C. 4 Form dough into 60-80g balls and sit next to each other, just touching on a baking tray lined with baking paper. 5 For the cross paste, mix all ingredients until smooth, then transfer to a zip lock or piping bag and pipe intersecting lines over your hot cross bun rows. Bake at 190°C for 20-30 minutes until golden and cooked through. 6 For the glaze, add water, syrup and sugar to a small saucepan and stir over medium heat to dissolve the sugar. Apply warm glaze to hot cross buns, with a pastry brush, reheating the glaze if necessary. P.s. If you happen to live in the tropics you can just leave your dough to rise outside in a sheltered area and leave your oven off until you have to bake them. N.B. I used a flat ‘K’ beater, as the dough hook didn’t blend the butter in properly and as it is such a short mix time it isn’t required here, as it would be for a normal dough. You are currently browsing the Tina’s Foodie Blog weblog archives for April, 2011. Entries (RSS) and Comments (RSS). 26 queries. 0.201 seconds.